Supply couldn’t keep up with demand in the gold market last quarter. World Gold Council data show that demand totaled 1,034.5 tons, while supply increased by only 1,032 tons. This explains why the price of gold increased. The surprise in the data is where demand came from. 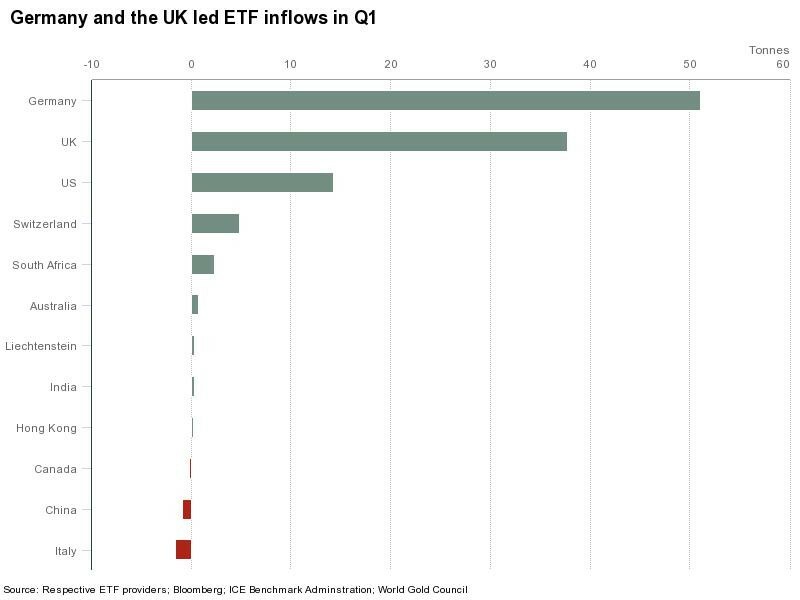 Investors in Germany and the United Kingdom invested over eight times more in gold exchange-traded funds (ETFs) than investors in the U.S. This is the third consecutive quarter that European markets dwarfed U.S. demand. Inflows into European-listed products totaled 92.4 tons last quarter. U.S. investors bought just 14.1 tons of gold ETFs. Gold is an investment linked to crisis. Gold buyers are telling us they’re worried. German investors understand the risks German banks face if Greece defaults on its debts. Germany is Greece’s largest creditor, with about $96 billion in loans outstanding. German investors also face negative interest rates and slow economic growth. When measured in terms of gross domestic product per capita, Germany is growing at about the same pace as Italy. Germany is Europe’s third-weakest performer under this metric. Negative interest rates make bonds less attractive, and slow economic growth makes stocks less attractive. German investors are acting rationally by turning to gold. In the U.K., investors are learning that divorce can be expensive. The European Union is demanding up to €100 billion (nearly $110 billion) from the U.K. before they even begin serious Brexit negotiations. When voters went to the polls last summer, few believed the bill to leave the EU would be that big. Now, costs are mounting, and fear is growing. With uncertainty growing in the U.K., gold is a rational choice for investors. Germany and the U.K. could also be affected by political events in France. This isn’t a good time for an inexperienced leader to take the helm of the country, but the voters have spoken. They chose a leader without a track record, and it’s an additional source of uncertainty in Europe. The list goes on with problems in Italy, Greece and other members of the EU. Political risks dominate Europe … and investors are turning to gold. Gold may not be getting the respect it deserves in the U.S. But in Europe, demand for gold is rising and could fuel a global bull market. Is Gold About to Break Out?